As the place to see and be seen amongst Hong Kong’s art crowd, Duddell's is bound to get creative when it comes to cocktails. Recently, resident mixologist Masumi Tomioka and JIA Group’s award-winning bar specialist James Barker teamed up to create an all-new “Harmony” cocktail series that takes inspiration from Eastern wisdom. Inspired by Japanse ingredients, The Nightingale consists of Hennessey VSOP Cognac, matcha, soy, almond, brown sugar and red shiso powder. Created by Dr Fern’s “head of prescriptions” Pauline Jam, this beautiful cocktail was inspired by traditional Chinese horse lamps from the fourth century. Served in the aforementioned lamps, it contains Whitley Neill Quince Gin, homemade grape soda, and citric acid topped with frozen flowers. Be quick, though–it’s only available until March 30. This supernova of a cocktail is one of three art-inspired cocktails crafted to celebrate The Woods’ latest bar-within-a-bar concept, The Lodge. 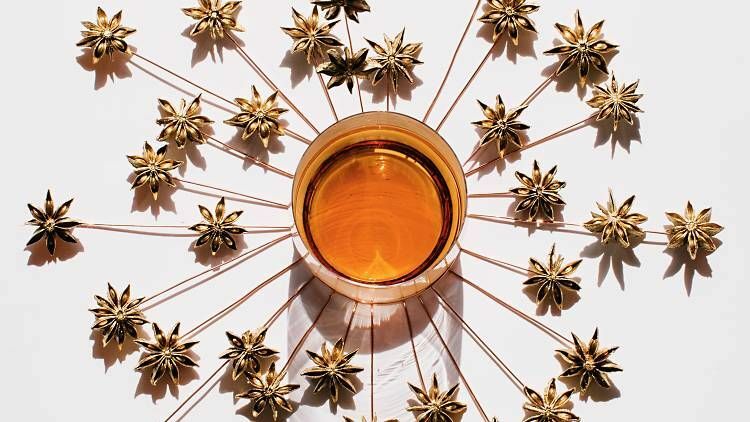 Made from a five-spice and dried fruit infusion and served with walnut ice, Starburst is served in a Tom Dixon “Tank” low ball glass adorned with star anise used in the infusion which has been painted gold. The Lodge currently by invitation only, but if you haven't managed to score an invite, you can book a seat for April and beyond. Zuma is bringing sakura season to Hong Kong. Along with a cherry blossom installation by floral artist Kirk Cheng, a collection of limited edition sakura-themed cocktails will also be on offer. The Sakura Sour, however, is by far the prettiest. The blend of Nikka Coffey Grain Whisky, red wine Umeshu, peach, yuzu, Orgeat, egg white is topped with a cherry blossom and is truly irresistible. Hotel Icon’s snazzy Cantonese restaurant Above & Beyond pays homage to local artists, like Kim Sungho and Janko Lam, in its limited edition series of art-inspired cocktails. The Pearl of the Orient is particularly impressive, as it’s topped with an edible image of the Hong Kong skyline by Kim.